The 7.2-magnitude ‘Big One’ hasn’t happened yet, but Metro Manila trembled with thousands of footsteps and cries. 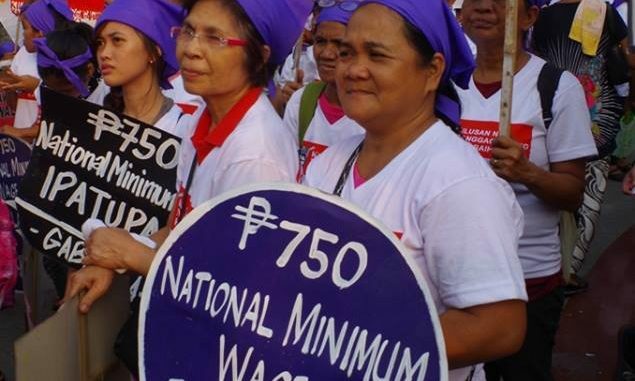 “Ngayong araw, yayanigin natin ang sistemang matagal nang nang-aapi at nagsasamantala sa ating bayan. Yayanigin natin ang dayuhang interes sa ating sariling bayan. Yayanigin natin ang pamamayani at paghahari-harian ng mga panginoong maylupa sa ating bayan. Yayanigin natin ang korap at pasista ng ating pamahalaan. Yayanigin natin ang sistema na nagbubunga ng mga tuta, pasista, at diktador na katulad ni Marcos at Duterte,” said Kabataan Partylist representative Sarah Elago. 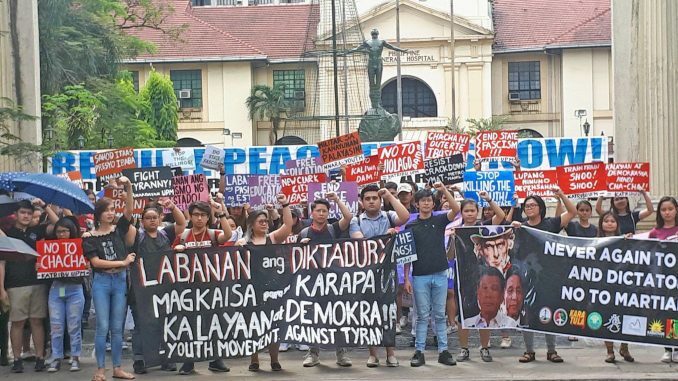 Students from universities and colleges across Metro Manila gathered in front of the Far Eastern University gates today to protest the Duterte government’s “rising tyranny and looming dictatorship”. 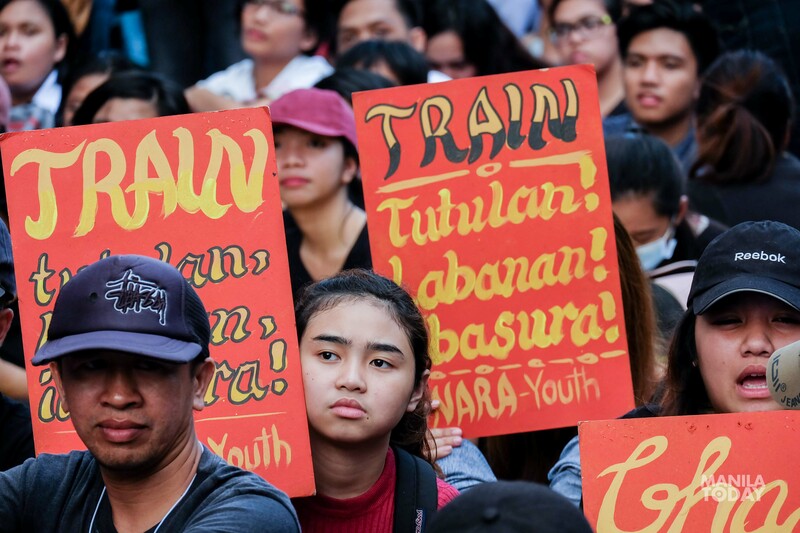 Led by Youth Act Now Against Tyranny, ‘Youth Quake’ gathered thousands of people in Morayta and Mendiola Bridge to register their collective dissent against the Duterte government’s various anti-people policies. Pat Cierva from the University of the Philippines Manila cited the irony of the Duterte government’s policies. “Bilang mga estudyante ng UP Manila, karamihan sa amin ay nagsasanay upang magsalba ng mga buhay. Sobrang nakakabastos itong si President Duterte at kanyang rehimen dahil sa kanyang kawalan ng respeto sa buhay ng mga mamamayan,” she said. UP Manila students protested in front of the university’s Oblation statue, found along Taft Avenue. Photo by Agatha Rabino. 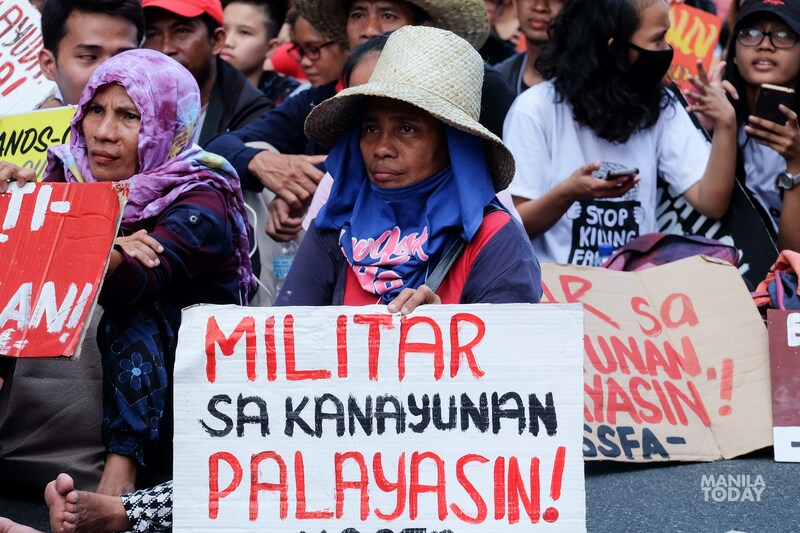 Cierva further noted that if the drug war did not kill one with a bullet to the chest, various policies like the tax reform law would “slowly kill the people”. Students, peasants, and workers protested against the Tax Reform for Acceleration and Inclusion Law. Photo by Kate Simple. 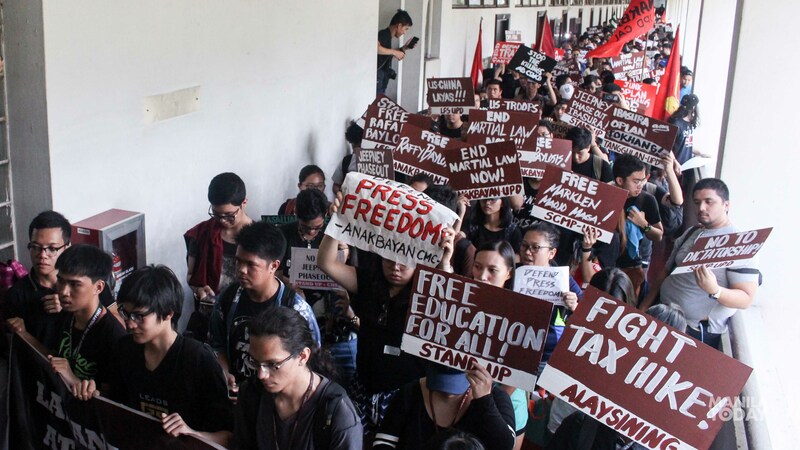 In the University of the Philippines Diliman, several colleges suspended classes altogether to allow students to walk out of their rooms and join the protest. Students held a snake rally at the College of Arts and Social Sciences in UP Diliman before heading to Manila. Photo by Shane David. 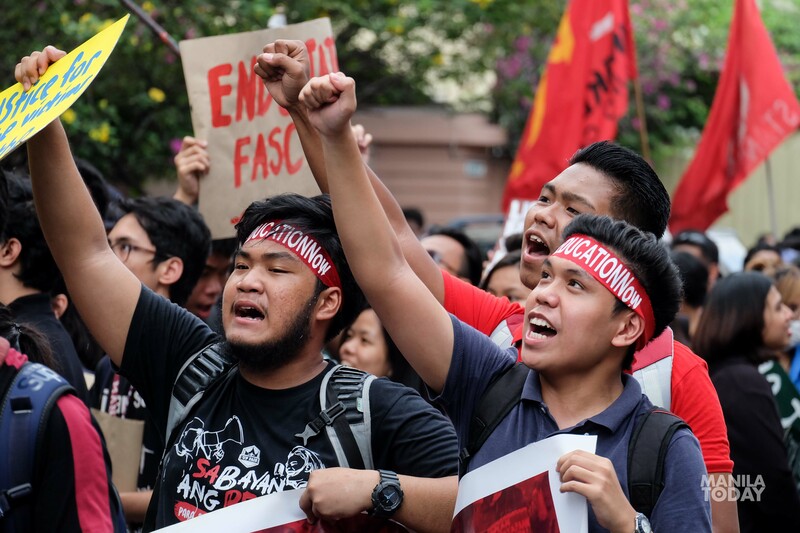 Despite having been barred by security guards from exiting the gates, Far Eastern University students managed to join the mobilization. Youth protesters enjoined FEU students to walk out. Photo by Kate Simple. Students protested against unreasonable school fees despite the government’s policy of free tuition in colleges and universities. Students from the K+12 program slammed exorbitant graduation fees and the labor export policy which justifies Filipino skilled labor abroad. 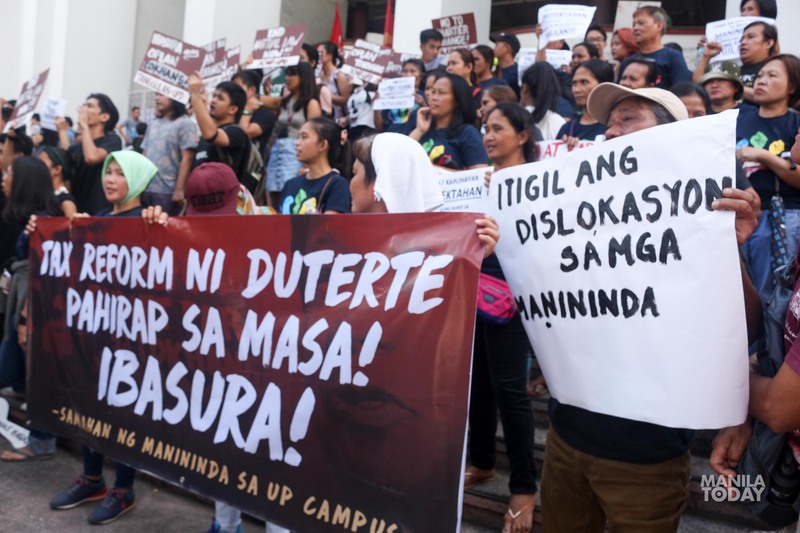 Members of student publications and communication students were also there to assert press freedom amid the government’s iron hand on journalists and media workers. “Ang mga manunulat ay organisador. Ang mga manunulat ay aktibista dahil hindi nila hahayaang ang magsulat ng kasaysayan ay mga mamamatay-tao, mga sinungaling, at mga magnanakaw,” said University of the Philippines Diliman College of Mass Communication Student Council chairperson Mikko Ringia. Not only did we see a solid unity of college and senior high school students in the protest — who together recognize the potential of the youth to actively engage and take part in shaping society — we also witnessed how the students linked their struggles to the struggles of the basic sectors. 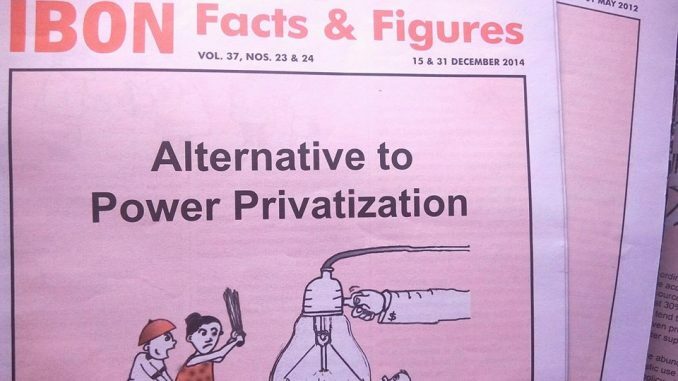 “Alam natin na malaki ang potensyal ng mga kabataan. Ngunit alam din natin na lahat ng panlipunang pagbabago ay mapagtatagumpayan ng mamamayang Pilipino kapag mahigpit silang makiisa sa malawak na hanay ng mamamayan,” said a senior high school student from the University of Santo Tomas who together with others attended the protest, despite having received warnings from school administrators that they would be expelled if they walked out. 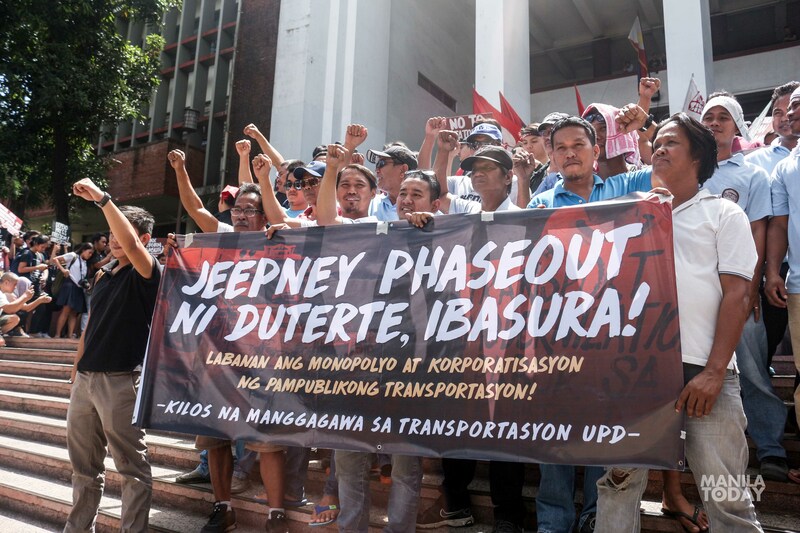 Present in the protest were jeepney drivers fighting for the scrapping of the PUV modernization program wherein old jeepneys will be replaced by new unaffordable units; farmers from Eastern Visayas demanding agricultural support for typhoon-stricken provinces and an end to militarization; and workers struggling for regularization and just wages. 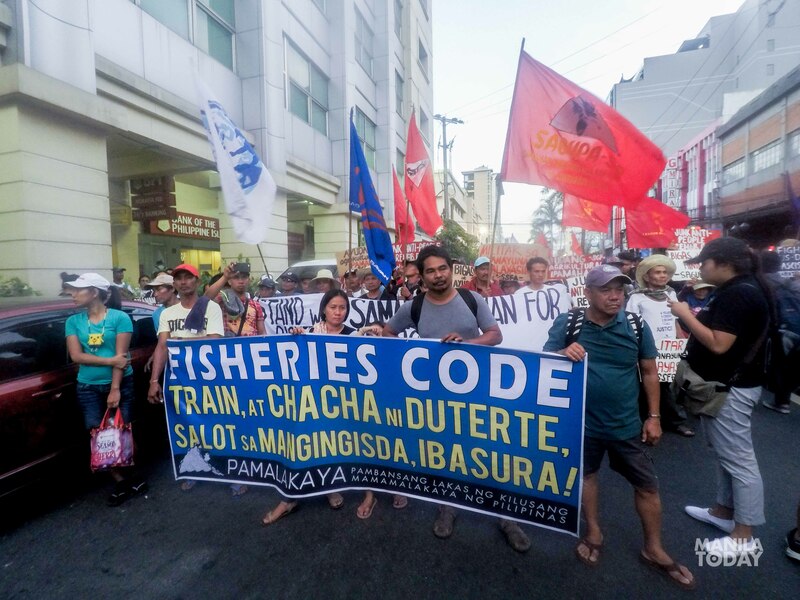 Various sectors also joined the youth-led protest in Morayta, Manila. Photos by Shane David, Kate Simple, Vanni Urbiztondo, and Patricia de Luna. 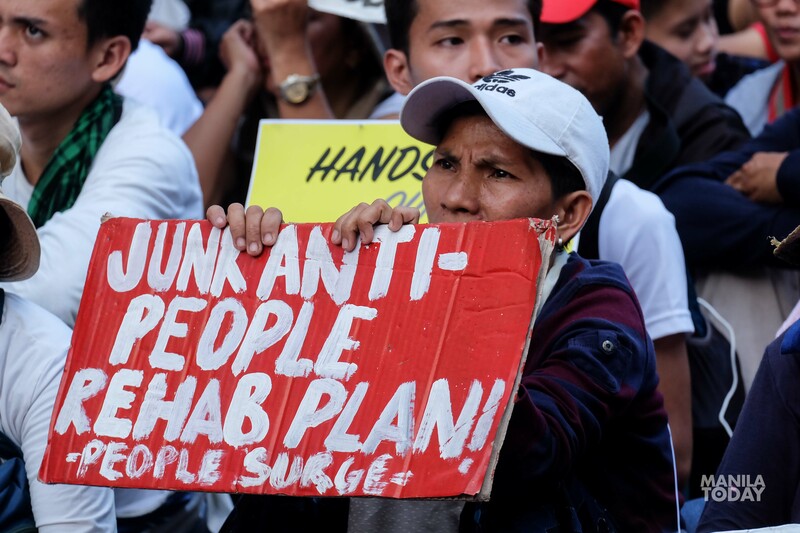 As they marched to the gates of Malacañang, the protesters marked today as the first day of a series of student walk-outs towards “overthrowing the tyrannical Duterte presidency”. 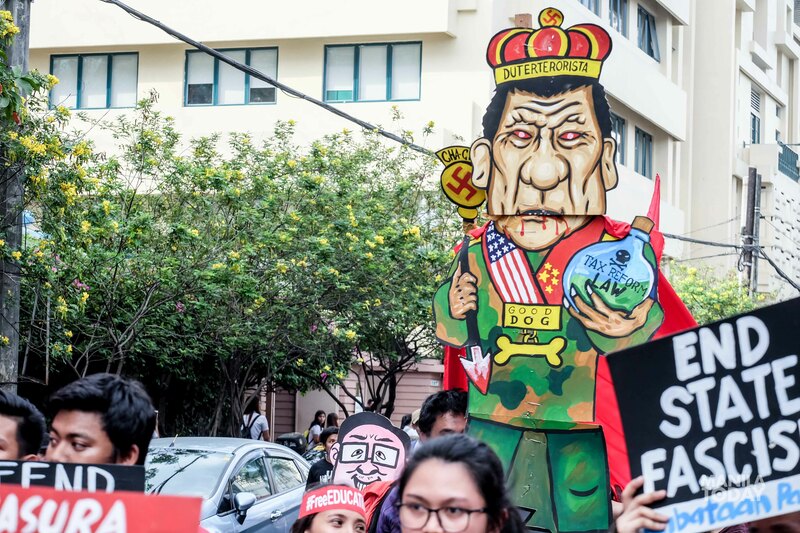 An effigy of President Duterte as the “King of Fake News” for “failing to fulfill his promises to the people”. Photo by Kate Simple. And did Malacañang tremble in silence. Only the shouts of the people and the crackle of the president’s burning image could be heard. 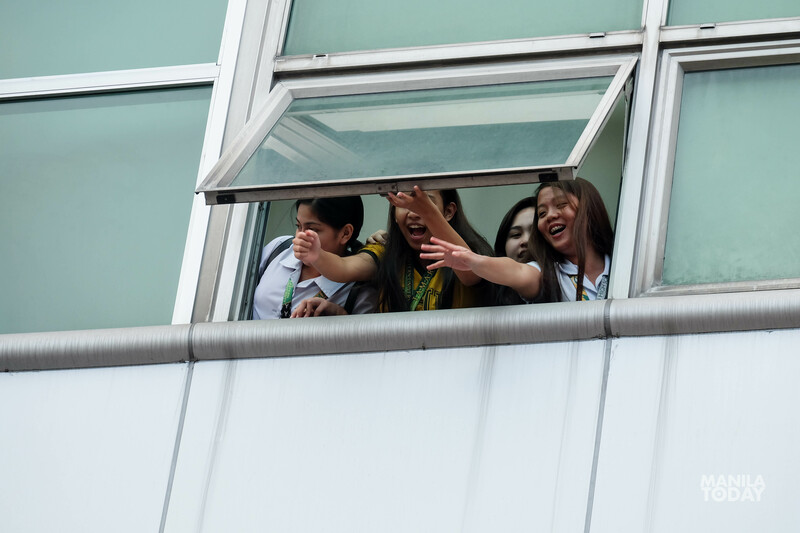 The post The other ‘Big One’: Youth Quake shakes Metro Manila as students walk out of classrooms appeared first on Manila Today.